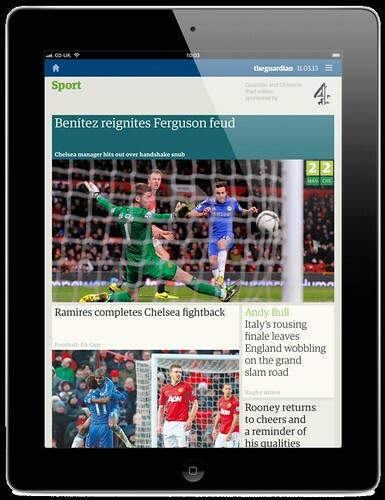 The Type Tuesday event at St Bride Library in London is a chance to hear art director Mark Porter talk about the challenges of adapting newspaper and magazine contents to new platforms, including the iPad and other tablets. Other participants include Mark Wilson and Alex Breuer. This is the first of Eye’s quarterly evenings at the Fleet Street venue, the scene of several previous Eye-associated events, including the Music Design conference in 2010 and last year’s ‘Out of the Box’ archive night. 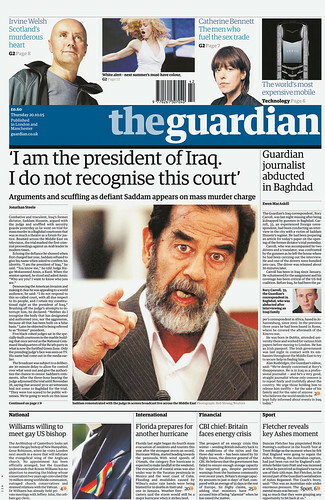 Guardian redesign, 2005-. Creative director: Mark Porter. In his own words, Mark Porter ‘designs things that people read.’ A self-taught designer, he worked at Direction magazine and Colors before becoming creative director at The Guardian, where he masterminded the paper’s 2005 move to the Berliner format (above). For this radical redesign, Porter commissioned the Guardian Egyptian typeface family from Paul Barnes and Christian Schwartz (aka Commercial Type). 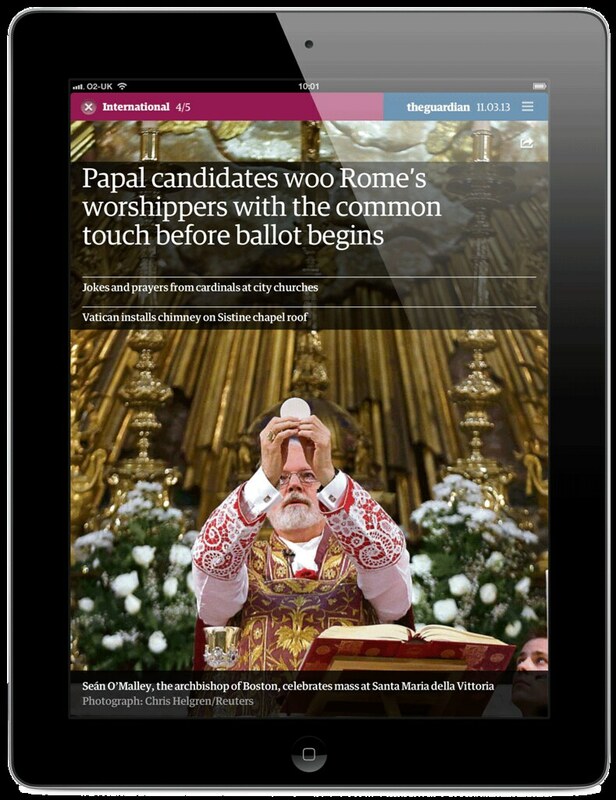 His company Mark Porter Associates has recently carried out redesign projects for Publico (Portugal), Internazionale (Italy) and designed the Guardian iPad app (judged one of the World’s Best news apps by the Society for News Design. 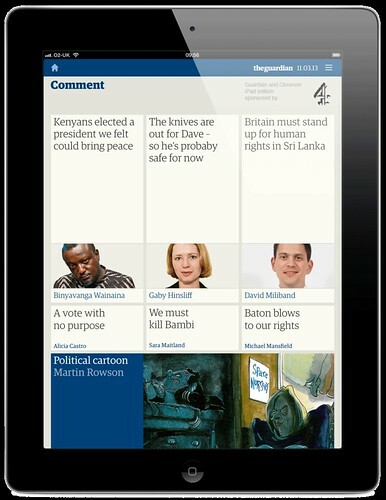 Top and below: Guardian iPad app, 2011-. Creative director: Mark Porter. Designers: Andy Brockie, Barry Ainslie. Product Manager: Jonathon Moore. See also Mark Porter’s blog. After Porter’s talk there will be a short break (during which you can buy a bargain back issues of Eye), followed by a panel discussion with Mark Wilson (of Wilson Fletcher, which has recently developed tablet versions of magazines such as Auto Express and Grazia) and Alex Breuer (formerly of The Times, now Guardian art director). Eye is the world’s most beautiful and collectable graphic design journal, published quarterly for professional designers, students and anyone interested in critical, informed writing about graphic design and visual culture. It is available from all good design bookshops and online at the Eye shop, where you can buy subscriptions and back issues.